Convenient parking near Charlie Vergos' Rendezvous is available at the Parking.com location listed. Click on the location address for location hours, rates, detailed location information, and a map. For over 70 years, Rendezvous has been a quintessential Memphis experience. The restaurant has been serving its signature dry rub ribs in a basement through a downtown alley across from the Peabody Hotel. 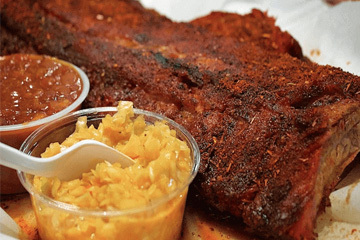 Locals, tourists, dignitaries, and celebrities all visit the restaurant for the ribs, as well the delicious sides. Rendezvous is located near Autozone Park, the Orpheum Theatre, National Civil Rights Museum, Beale Street, Fire Museum of Memphis, Memphis Cook Convention Center, Memphis City Hall, and St. Jude Children's Research Hospital.